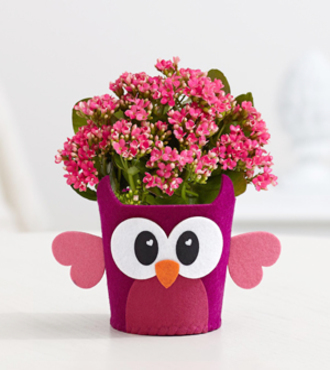 Send your love with a beautiful pink kalanchoe or calandiva plant inside a fun, whimsical felt owl container. The charming and playful owl always love you is the perfect way to put a smile on that special someones face. This is a sweet surprise for anyone with a sense of humor and soft spot for anything adorable.